Researchers from the University of Pittsburg report a new “all-in-one” immunotherapy approach that could lead to a new vaccine to help HIV-positive people to fight the virus without having to take daily medications. 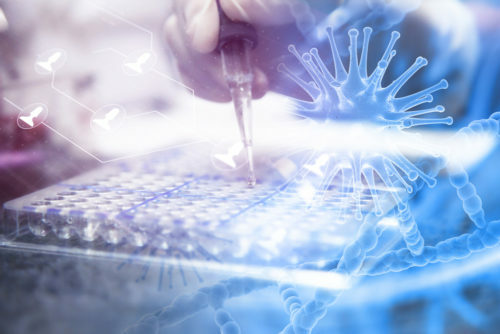 Their new approach exploits another virus, Cytomegalovirus (CMV), which typically causes eye infections and other serious illnesses, to draw HIV into the open. CMV is present in more than half of adults and 95% of those infected with HIV. It’s usually kept in check by an otherwise healthy immune system. “The immune system spends a lot of time keeping CMV in check; in some people, one out of every five T cells (white blood cells that fight illness) are specific to that one virus,” said Charles Rinaldo, Ph.D, a professor and chair of Pitt Public Health’s Department of Infectious Diseases and Microbiology, via a press release. In other words, doctors found T cells that fighting CMV are also infected with HIV. They then researched how to safely destroy these HIV-infected T cells using another immune system defense: dendritic cells, a white blood cell that marks infected cells for destruction. To test their theory, researchers brought in two dozen people from the Pitt Men’s Study to collect enough blood for the test. The Pitt’s Men’s Study is the Pittsburgh location for the Multicenter AIDS Cohort Study (MACS), a research study focused on the natural history of treated and untreated HIV/AIDS in gay and bisexual men. Dendritic cells are also used in cancer immunotherapies; Mailliard had previously worked on research using dendritic cells to fight melanoma. Researchers used, “antigen-presenting type 1-polarized, monocyte-derived dendritic cells,” or MDC1, to seek out and activate the CMV-specific cells. By drawing those cells out, they were able to draw latent HIV hiding within them. The team is currently raising funding to begin clinical trials in humans.